Training information and guidance on hexavalent chromium exposure at the Qarmat Ali Water Treatment Plant in Basrah, Iraq, was provided by the Department of Veterans Affairs to all VA Regional Offices in 2010. It’s important for veterans who were affected by exposure to lung carcinogen hexavalent chromium by the Qarmat Ali Water Treatment Plant during active duty service to know how the VA is guiding its employees to handle the associated claims. General Information: From approximately April through September of 2003, Army National Guard (NG) personnel from Indiana, West Virginia, South Carolina, and Oregon served at the Qarmat Ali Water Treatment Plant in Basrah, Iraq, and were assigned to guard contract workers who were restoring the plant. During that time, sodium dichromate, a source of hexavalent chromium, which was previously used as a corrosion-preventing chemical by former Iraqi plant workers, was found on the ground and measured in the air. Hexavalent chromium, or Chromium VI (six), in sodium dichromate is a lung carcinogen through inhalation. Chromium VI is also an acidic compound that can cause immediate irritation to the eyes, nose, sinuses, lungs, and skin. USACHPPM provided a medical evaluation for certain soldiers there at the time, which took place in October 2003. According to USACHPPM, 137 service members were evaluated. The results at the time showed some abnormalities in individuals, such as complaints of eye, nose, throat and/or lung irritation, or abnormal pulmonary function, kidney, or liver tests. However, the Army stated that it could not specifically trace these symptoms to chromium exposure. C&P Service has also begun researching the list of identifiable service members to determine who has filed claims for disability benefits for any condition potentially related to this toxin exposure. Research is ongoing and is primarily focused on, but not limited to, diseases of the skin and respiratory system. This assessment takes into consideration all identifiable members of the Guard who have previously filed disability claims for such conditions and who have claims currently pending for such conditions. It also assumes that such claims were filed after exposure, but not necessarily expressly related to exposure. The Veterans Health Administration (VHA) has begun to augment the Gulf War Registry to reflect service at Qarmat Ali. VHA is verifying the numbers of these Veterans who have either enrolled in care or received a Gulf War Registry examination. The involved Guard members who have had an initial examination will be recalled to have a complete exposure assessment as well as a more targeted physical examination and ancillary testing to detect indications of health outcomes that may be related to hexavalent chromium. Those who have yet to enroll in the registry will receive this targeted exam initially, which includes a chest radiograph and pulmonary function test. This evaluation will be repeated periodically. DoD has confirmed with VA that NG personnel from Indiana, West Virginia, South Carolina, and Oregon served at the Qarmat Ali Water Treatment Plant in Iraq. Therefore, verification of individual exposure is not required for Veterans who served in one of these NG units if their service in Iraq was between April through September 2003. 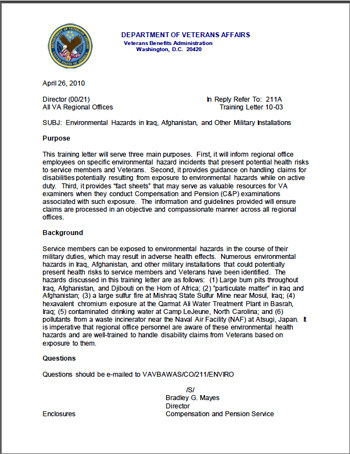 Because of the potential of receiving claims due to exposure to environmental hazards from Veterans who served in Iraq and Afghanistan, employees should review VBA Letter 20-07-19 dated February 6, 2009, to determine if “priority processing” procedures apply. Upon receipt of service connection claims for disabilities due to exposure to environmental hazards or toxic agents, establish a standard end product, (e.g., 110, 010, 020). A special end product to control these issues is not necessary. Employees involved in the development of these claims must choose the appropriate Special Issue identifier on the MAP-D Contentions screen. Currently, the only identifier pertaining to exposure claims is “Environmental Hazard in Gulf War,” which is only appropriate for exposure within Southwest Asia. As C&P Service updates corporate applications, (i.e., MAP-D, RBA 2000, etc.) to better track and identify these types of claims, we will notify the field accordingly. Therefore, so as not to dilute future data on hazardous exposure claims regarding Southwest Asia service, do not use the “Environmental Hazard in Gulf War” identifier for claims regarding Atsugi or Camp Lejeune service. By taking the following steps in the development process, raters will be well-equipped to make fair and equitable decisions on service-connection claims as a result of exposures to environmental hazards. • If Veteran alleges exposure to environmental hazards during service, but does not claim service connection for a specific disability, inform the veteran that he/she must at least identify a symptom or cluster of symptoms since exposure in and of itself is not a disability. • Ensure the claimant provides at least some general information about the exposure event. A follow-up letter or phone call to the Veteran may be required if the Veteran fails to provide sufficient information regarding exposure and/or disability claimed because of such exposure. o Notwithstanding the foregoing instructions, regional office personnel must actively review cases for potential exposure. While many service members who served in Iraq and/or Afghanistan may have been exposed, for example to burn pits and particulate matter, not all Veterans will be aware of such exposure or will associate such exposure with specific disabilities. o Therefore, regional office personnel must be vigilant in reviewing claims from Veterans with Southwest Asia service, especially when the claim is for service connection for disabilities such as respiratory, skin, autoimmune, neurological (except where clearly caused by injury), gastrointestinal disorders, etc. Many Veterans will simply be unaware of the possible link between such disabilities and the exposures discussed in this training letter. In these cases, it may be necessary to invite or solicit a specific claim from the Veteran and undertake the development procedures explained in this training letter. • Develop for service treatment records and any VA and/or private medical records that are noted by the claimant. • Verify dates of military service and obtain military personnel records as per normal procedures. You may download a copy of the Qarmat Ali Water Treatment Fact Sheet, which is part of the VA’s April 26, 2010 letter to its Regional Offices, here. To more fully understand how military service may be linked to your current health conditions, become a VetsHQ Premium Member and complete a comprehensive assessment of all of your current health conditions on the VetsHQ Compensation tab, and see the full range of other benefits you earned through your military service. Membership is just $2.99 a month or $19.99 a year.